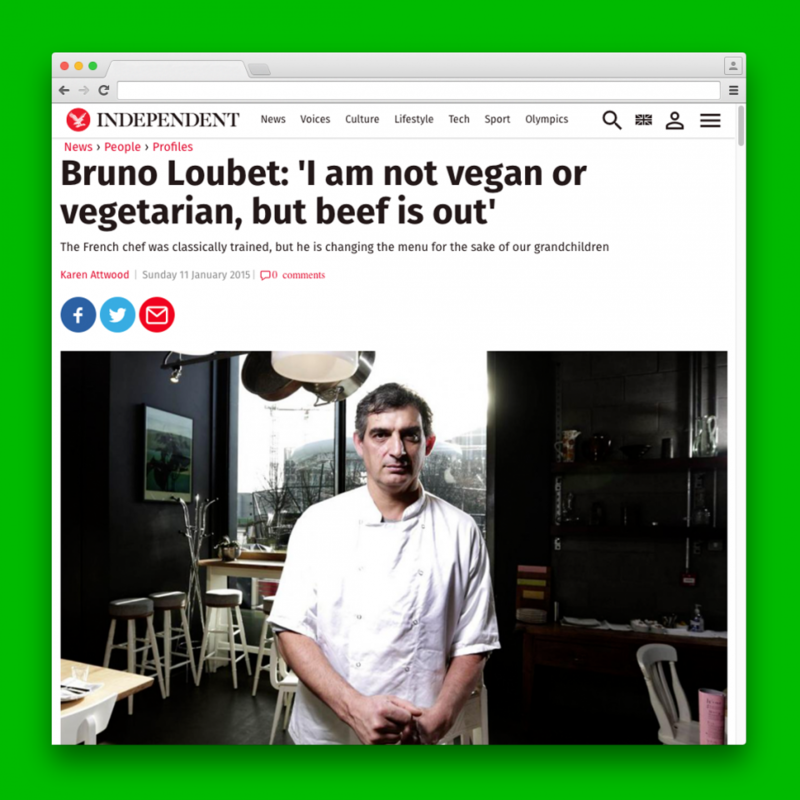 Bruno Loubet, the Michelin-starred French chef famed for his classical meat dishes, is banning beef from the menu at his restaurant Grain Store. The large, bright 200-seat restaurant, which opened in King’s Cross, London, 18 months ago, has already garnered attention for making vegetables the main attraction while fish or meat take second billing. Grain Store, named London Restaurant of the Year last year at the Sustainable Restaurant Awards, uses free-range meat, sustainably sourced fish, and herbs as well as edible flowers from a community garden located next door. But now Loubet is going one step further and plans to cut beef – which currently features in just one dish at Grain Store – from the restaurant’s spring menu. Although Loubet’s career trajectory may seem at odds with his current tastes, he is really returning to his roots. The chef “grew up eating vegetables”, one of seven children, in Bordeaux, where meat was an occasional treat and much of the family’s diet was made up of vegetables grown in the garden or foraged. Now, the only time he relaxes is when he is in his garden in Bedfordshire, and he feels “a strong connection to the land”. He had a dream of creating a restaurant like Grain Store 20 years ago, “but 20 years ago, it was a crazy idea, so I kept it to myself”. Instead, he followed the traditional French cuisine route, making his name at Raymond Blanc’s Manoir aux Quat’Saisons and at Inn on the Park, at the Four Seasons, where he earned a Michelin star within a year. He opened the hugely successful Bistrot Bruno in Soho and L’Odeon before moving to Australia for eight years with his wife and three daughters. In 2010, a year after returning to Britain, he opened Bistro Bruno Loubet at the Zetter Hotel, with his partners Mark Sainsbury and Michael Benyan. With the Zetter Group also focused on sustainability (Sainsbury is one of the founders of the Sustainable Restaurant Association), Grain Store seemed the logical next step. And this time, the UK was ready. Loubet is “very proud we managed to bring this idea that you can eat very well by eating much less meat and have exciting colourful tasty food on your plate”. It was a “big idea” to bring to the public. Not only the menu is sustainable. The furniture at the restaurant is reclaimed, waste is kept to a minimum and there is a computerised extractor system which switches off if there is no heat going in. Loubet’s wife Catherine has become vegan since research for the Grain Store project led her to appreciate the heavy environmental impact of a meat- and-dairy-based diet. Loubet himself has dropped 10kg after reducing meat. Becoming a grandfather – his eldest daughter Laeticia has a five-month-old girl – further reinforced those beliefs. Carnivores need not despair: meat is not entirely coming off the menu yet and Bistro Bruno Loubet continues to serve rib-eye steak and pig’s trotters. But it is obvious that Loubet’s main focus is to get even better at cooking without meat and to open more Grain Stores in the future. Perhaps even a vegan restaurant.